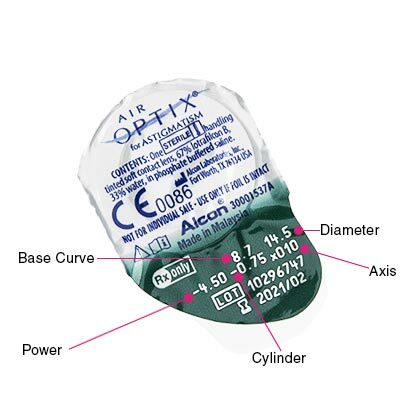 Only prescriptions with a ‘cylinder’ figure will also have an ‘axis’ measurement. Axis indicates in degrees exactly where on the eye the astigmatism is located – it will always be a figure between 0 and 180°. Cylinder, combined with axis, compensates for astigmatism, a condition where the eye is not spherical, refracting light into the eye differently. Cylinder can be preceded by either - (minus) to correct short-sighted astigmatism or + (plus) to correct long-sighted astigmatism. 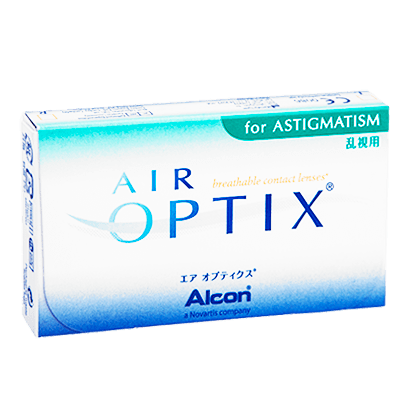 Air Optix for Astigmatism by Alcon provides you with exceptional comfort and performance all day long. Correct blurred or distorted vision by wearing these Air Optix toric contact lenses. These lenses ensure stable and uninterrupted vision as their PRECISION BALANCE 8|4 helps the lenses to remain in place through two points of stability. These toric lenses have been made from silicone hydrogel, which allows more oxygen to pass through your lenses, maintaining comfort and making your eyes feel rejuvenated and fresh throughout the day. These lenses feature TriComfort technology, providing three benefits – high breathability, exceptional hydration and resistance to deposits and build-ups. 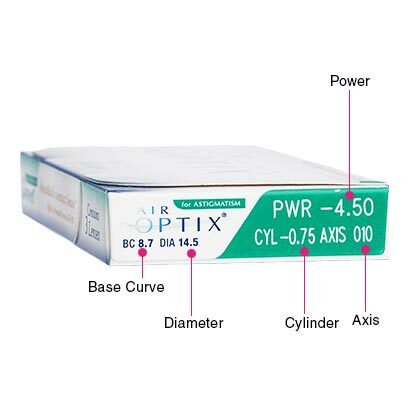 Air Optix for Astigmatism are monthly contact lenses for daily wear. They need to be taken out each night before going to bed. To maintain the hygiene these lenses need to be cleaned with contact lens solution. ReNu Fresh Multi-Purpose solution helps you keep your lenses in best condition and is available at Feel Good Contacts. Air Optix for Astigmatism also offer extended wear, which means you can wear them for a maximum period of a week, both day and night. This is ideal for frequent travelers or those who have a hectic work schedule. However, it is advised to first contact your optician to make sure that extended wear is suitable for your eyes. If you are looking for an alternative to Air Optix for Astigmatism contact lenses, then Biofinity Toric contact lenses are recommended.